Johnson Diversey Beer Clean Single Serve Last Rinse Sanitizer Powder Pouch Pack 0.25 Oz. Johnson Diversey Beer Clean Sanitizer - 25 Oz. Johnson Diversey Sani-Sure Soft Serve Pouch Sanitizer - 1 Oz. Johnson Diversey Sani-Sure Powder Sanitizer - 0.125 Oz. 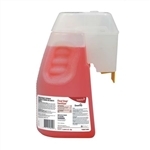 Lite Touch RTU Crt and PlexIglass Cleaner - 32 oz. Envy Instant Cleaner Germicidal Aerosol - 19 oz. Lemon Furniture Polish - 32 Oz. Beer Clean Last Rinse Sanitizer - 0.25 oz. Skidoo Institutional Flying Insect Killer II - 15 fl.oz. High Noon Urethane-Fortified Floor Finish - 5 Gal. Suma Rinse Aid Economy Clear Liquid - 1 Gal. Vectra Floor Finish - 5 Gal. Alpha HP Multi Surface Disinfectant Cleaner For J-Fill - 2.5 Ltr. Skidoo Institutional Flying Insect Killer II - 15 Oz. Vectra Resilient Floor Finish - 1 Gal. Virex II 256 1 Step Germicidal Cleaner - 32 oz. Virex II 256 One-Step Disinfectant Cleaner and Deodorant - 1 Gal. Good Sense Rtu Apple Scent Odor Counteractants - 32 oz. Good Sense Rtu Odor Counteractants Fresh Scent - 32 Oz. Glance Rtu Glass and Multi-Surface Cleaner - 32 Oz. Virex Tb Rtu Disinfectant Cleaner Deodorizer - 32 oz. End Bac II Disinfectant Spray Aerosol - 15 oz. Sanitizer Spray Bag in Box - 2.5 Gal. Alpha-HP Multisurface Disinfectant Cleaner - 5 Ltr. Beer Low Sud Suds Powder Pouch - 0.5 oz. Crew Heavy Duty Toilet Bowl Cleaner - 32 oz. Treatment Dock And Dumpster - 32 Oz. Cleaner Beer Clean Manual Beer Brush Powder Pouch - 0.5 oz. Solvent Beer Clean Mineral Powder - 0.25 oz. All Purpose Easypaks Cleaner - 0.5 oz. Easypaks Bowl Cleaner - 0.5 oz. Twinkle Polish Water Aerosol Cleaner - 17 oz. Peridiem Smart Dose Floor Cleaner - 47.3 oz. Suma Stop Slip - 1 Gal. Suma Supreme Pot and Pan Detergent - 2.5 Ltr. Medium Scoop Style Box - 2.12 in. x 2.38 in. x 4.38 in. Glenvale Interfolded Medium Weight Dry Waxed Deli Papers - 10 in. x 10.75 in. Beer Clean Glass Cleaner - 0.5 Oz. Suma Pan Clean Pot and Pan Cleaner Detergent - 2.5 Gal. Stride Neutral Floor Cleaner Citrus - 5 Gal. Pro Strip Heavy Duty Floor Stripper Light yellow - 5 Gal. Neutralizer Conditioner - 0.5 Oz. Stride Neutral Citrus Floor Cleaner - 32 Oz. UHS SC Floor Cleaner - 32 Oz. AccuMix Stench and Stain Digester - 32 oz. Citrus Express Gel Carpet Care - 32 oz. Suma Blend Mechanical Warewashing Detergent - 1 Gal. Suma Block Whitener - 1 Gal. Pro Strip Heavy Duty Floor Stripper - 1 Gal. Stride Neutral Floor Cleaner - 1 Gal. Suma Calc Descaler D5 - 1 Gal.